2) Choose the Group in your Library that contains the video. 3) Under the Videos section, highlight your video. 4) Choose Twitter from the Share section. 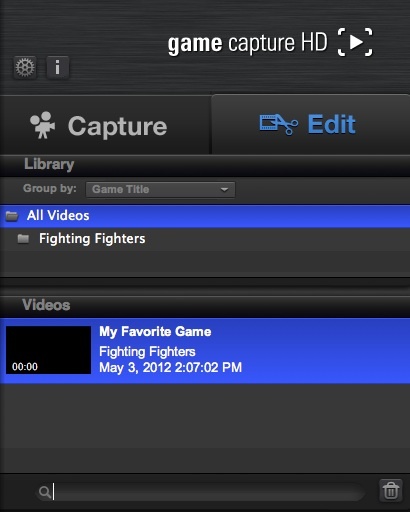 5) If you have already entered your Twitter account into Elgato Game Capture HD in the past, it will be pre-selected. Otherwise, use the Add button to enter your Twitter Username and Password. Select YouTube or Facebook as your Video Provider (the location where your video will be stored). 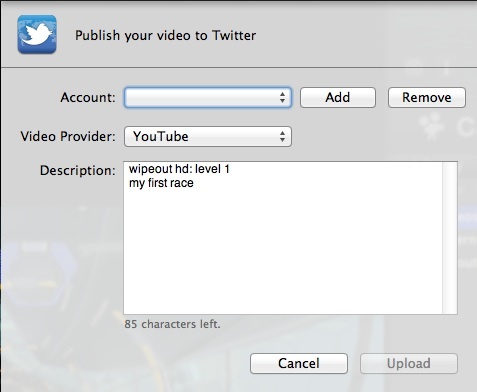 If this is the first time you've used Twitter with Elgato Game Capture HD, then you will be asked to confirm the connection, and then enter a PIN. 6) If you selected Facebook as your Video Provider, then after your video encodes, a Facebook Authentication window will appear, where you can enter your Email and Password. 7) If you selected YouTube as your Video Provider, and if you have already entered your account into Elgato Game Capture HD in the past, it will be pre-selected. Otherwise, enter your YouTube Username and Password. If you do not yet have an account, press the Create Account button.